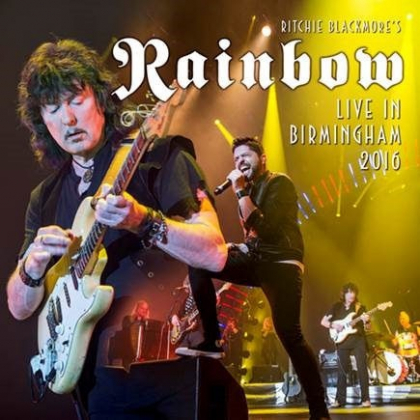 In June 2016 legendary guitarist Ritchie Blackmore made his much-anticipated return to rock music as Ritchie Blackmore’s Rainbow played three concerts in Europe, two in Germany and one in England. The two German shows at Loreley and Bietigheim were caught on camera to produce the concert film Memories In Rock, which was released by Eagle Vision and Eagle Records back in November 2016. This new 2CD set captures the full audio from the only British show at the Genting Arena at the NEC in Birmingham on June 25th 2016. The only difference between the two recordings is that on this version you get “Soldier Of Fortune” and “Burn” from the Mark III Deep Purple era. While that is not a big difference between the two versions now available, I do think Ronnie Romero sings better on this one, less stage fright perhaps? It was a big ask for Ronnie to command a stage that big with Ritchie running the show, but he pulled it off. Obviously while the vocalist was important, and a massive Social Media war broke out regarding just who should sing for Rainbow on this tour, with some previous Rainbow vocalists even putting themselves forward, what people wanted to know was whether or not Ritchie Blackmore was still able to play the Deep Purple and Rainbow classics at the sprightly age of 71. The overwhelming response was a massive yes, those fingers ran up and down that fretboard as if it was the 10th of November 1975 all over again. The sound has been mixed well, a delicate blend of vocal and backing band with Ritchie’s guitar just loud enough to be commanding yet not domineering. If you were fortunate to be at this gig, and I was, you just couldn’t help but marvel at Ritchie’s guitar playing, it was spellbinding. The cd opens with the intro ‘Over The Rainbow’ before ‘Highway Star’ kick starts the show. From then on in we are treated to some of the rock world’s greatest songs. Rainbow tracks like ‘Since You Been Gone’, ‘Man On The Silver Mountain ‘,’Long Live Rock ‘n’ Roll’ and the masterpiece that is ‘Stargazer’ are played with a passion only a near 20 year gap away from the rock stage can give you. Ritchie is on fire. The rest of the band are no slouches either, with Jens Johansson on keyboards and David Keith on drums being particularly impressive. The Deep Purple tracks ‘Mistreated’, ‘Perfect Strangers’ ‘Burn’ and ‘Child In Time’ still sound fresh today, despite some of them being 40 years old or more. The cd closes with arguably the most recognised guitar riff of all time, and no matter how Ritchie approaches it, there is no getting away from that famous four-note blues scale melody in G minor, harmonised in parallel fourths, or ‘Smoke On The Water’ to you and me. This is an essential cd for anybody’s collection. The Line-Up for the Birmingham show featured Ritchie Blackmore (Guitar); Ronnie Romero (Vocals); David Keith (Drums); Bob Nouveau (Bass); Jens Johanssen (Keyboards); Candice Night (Backing Vocals); Lady Lynn (Backing Vocals).